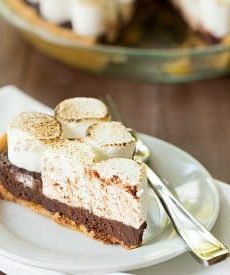 An easy no-bake recipe for a fabulous s'mores pie - graham cracker crust, chocolate truffle filling and toasted marshmallows on top. Make the Graham Cracker Crust: In a large bowl, whisk together the graham cracker crumbs, malted milk powder, sugar and salt. In a measuring cup, whisk together the melted butter and heavy cream, then pour over the crumb mixture. Using a rubber spatula, fold and mix and the ingredients together until all of the dry ingredients are evenly moistened. Turn the mixture out into a 9-inch pie plate and press evenly along the bottom and up the sides of the pan. Refrigerate while the chocolate filling is prepared. Pour the chocolate mixture into the chilled pie crust and spread into an even layer. Gently press the marshmallows into the chocolate filling, covering the top of the pie with marshmallows. Chill the pie briefly (30 minutes to 1 hour) to allow the chocolate the set. When ready to serve, use a kitchen torch to toast the marshmallows. The pie can be kept at room temperature as long as it's not warmer than about 72 degrees. If your kitchen is warmer than that, then I would refrigerate the pie so the chocolate filling doesn't melt.